It’s kind of funny, but my first exposure to quilting was back in the late 1980’s when the “quilting ladies” would invade the fabric store I worked at in droves to find just the right fabric combinations for their quilts. Calico and country print fabric bolts were flying every which way, and any flat surface in the fabric store would be covered with fabrics while the ladies discussed patterns, colors, and shades. So, I always thought that quilting was all about buying new fabrics for the quilts, because that’s how I’d always seen it done. Turns out that quilting can also be about making do, as in using up all of those odds and ends scraps you’ve been amassing while sewing other projects (or even other quilts). And even better, I’m finding really awesome free scrap quilt patterns and tutorials online – I think I see a scrap quilt in my future! 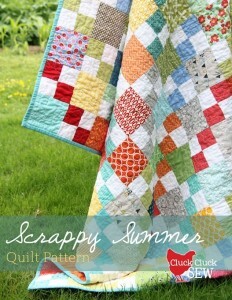 How awesome is Allison’s free Scrappy Summer Quilt Pattern at Cluck Cluck Sew? Totally. Awesome. I would love to snuggle up in a quilt just like this right now! Following Rita’s tutorial at Red Pepper Quilts for making this Postage Stamp Scrap Quilt makes it look easy – like as even I could make one and not go crazy! What a great way to use up those little fabric bits. And I really love this one, it has a traditional feel but looks really great made from scraps. I found this free quilt block tutorial through Craftsy for making an Arkansas Crossroads block, with which you can make a double-plus good scrap quilt just like this, see it to believe it! Find even more links to free scrap quilt patterns and tutorials at Craftsy’s post, 11 Scrap Quilting Patterns to Use Up Your Stash, and also look up this list at Better Homes and Gardens online, 10 Quilt Patterns for Scrappy Quilt Projects. How about you, have you ever made a scrap quilt, or is there an odds and ends quilt in your future? What is your favorite quilt pattern for using up scraps?